My dream library is vibrant, innovative, warm and welcoming and an acknowledged "centre of amazingness" within the school. It supports teachers and helps a culturally diverse population of students discover a love of reading and learning. The library is big, with a variety of areas to meet the different needs of students e.g. a quiet reading room, a Makerspace, a media production room, tiered seating for performances of plays/reader's theatre. Furniture is movable to allow students to configure areas to suit their current needs. Students can sit on, under and in furniture. There is a big range of comfortable seating options around the library, including an impressive-looking reading chair that teachers, and students, can read in. Outside the library is a private lawn surrounded by large leafy trees with even more seating options for outdoor readers. The reading room is soundproof and decorated in an immersive theme so that the students feel relaxed and peaceful. The media production room has camera equipment, microphones, an editing suite, music and podcasting equipment and a green screen. The library has iPads and laptops for students to use in order to provide some equity for those who do not have access to them at home. The library's budget allows for a good physical and electronic collection to be developed, enabling the school to cater to all students' personal interests and curriculum needs. There is a system so that students, teachers and parents are able to request books. The library's collection also includes makerspace items that can be borrowed by parents e.g. telescopes, microscopes, sewing machines. There is a strong online presence so students have access to the library 24/7. Students and librarians combine to make awesome, interactive library displays that are regularly changed. In addition to physical displays there are also student-made book trailers that show on the large library TV. The TV is also used to Skype in authors and subject experts into the school. The library publishes physical and electronic copies of student work. There is a student librarian programme giving training, library experience, rewards and privileges to interested students. A team of students help to run activities in the Makerspace and provide student voice around library decisions. The Makerspace allows students to be creative, solve problems and collaborate and introduces them to robotics, coding, 3d printing and crafts. There are library-run challenges and competitions to inspire creativity. 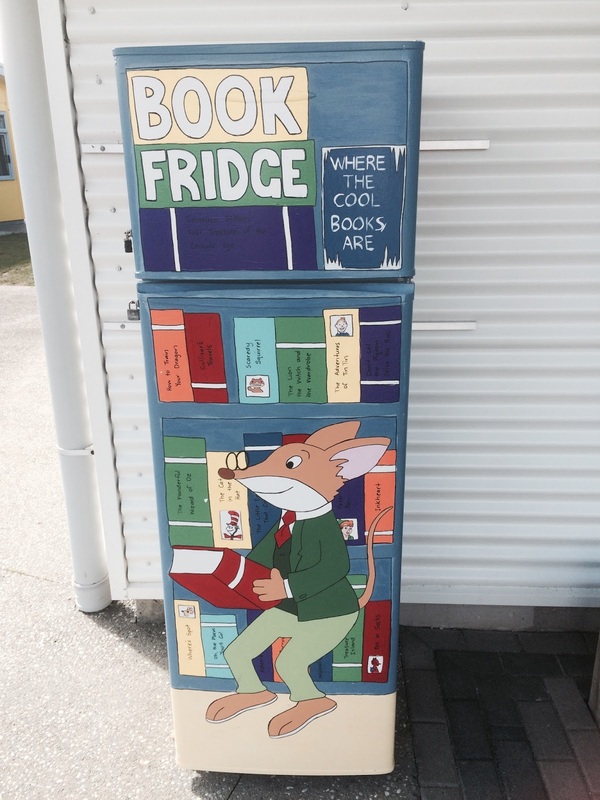 There is a book fridge so that students and staff can swap books from home with one another. The budget enables the library to be fully staffed, including over the holidays, in order to run summer reading programmes, and before school, at morning tea and lunch, and after school. Staff are paid well, have regular appraisals, access to good professional development and are respected as professionals. They are enthusiastic, dedicated, have strong professional networks and enjoy working with children. There are teachers on the library team who provide direct classroom teacher feedback on library initiatives and share their own ideas for the library. Library staff are involved with planning and collaborating with teachers in order to support the curriculum. They provide curated materials for the students and teachers which are regularly used. Library staff teach library skills, digital citizenship and information literacy in ways that are as fun and engaging as possible. They allow flexible scheduling and they are on hand for students who come to the library with research needs. The library helps feed a school-wide reading culture by employing staff with an excellent knowledge of children's books who make digital and physical reading guides, run book clubs (with teacher involvement) and are available to help children select books. Parents are able to use the library before or after school to help their children, including their preschoolers, select books and to discuss book selection with the library staff. Social media is used to engage the community with the library. The library manager has regular conversations with the Board of Trustees and senior management team around how the school's charter and the New Zealand Curriculum can be supported by the library. The BOT and senior management team regularly visit the library and are excited by the vision for the library, its collection and the programs that are taking place there. Finally, my dream library is not one-of-a-kind but just one of a nationwide, legally mandated chain of exceptional school libraries providing New Zealand's students with a passion for pleasure reading and lifelong learning. That's a great vision for the "dream school library" and I don't think there is much more I could add! What's particularly exciting is that nearly everything in your dream library is realistic and achievable - the only tricky bit is the "dream budget" that would allow the library to be fully staffed & allow for the "dream" collection. I also like the idea of having excellent school libraries legally mandated for. Now, wouldn't that be something? Loving the vision of your dream library! Now how can you go and make it a reality?!? How can I make my dream library a reality...win Lotto?! Have a librarian become Prime Minister?! My library has some of these things already, to varying degrees. There are ideas in there that don't require any money so they are the obvious places to focus on. Thanks for setting up the EdBlogNZ Challenge, they've been a lot of fun so far.